January first is just a few days away and we are just winding down from our holiday rush. This is the time when many families have a tradition of reflecting on the past years accomplishments and begin to plan goals for the up coming year. Some might make a New Years Resolution. My family likes to get together and talk about our successes and our not so successful attempts at goals and what we might change or add to our goals in the coming year. I am excited to share a goal with my blogging friends. I am going to work harder at becoming fit and health in the year 2012! With this goal in mind I was extremely excited to have the opportunity to review a very popular book, Fit Moms for Life. Written by Dustin Maher. The first question I asked about the book,"Is this like all the other diet and exercise programs available out there?" Well, I am happy to answer this No, absolutely not. Fit Moms for Life is a fitness program that is built around five pillars that make this different than most other weight loss programs. Fit Moms for life is a complete program that focuses on you as a mom, or mother to be. Lets face the facts moms are busy people. As a mom we are always taking care of others needs and seldom make time for our self. This program teaches you how to make the time for your self and how important it is to take care of your needs so that you can continue to give your family the best that you have to offer. My next question, "What are the five pillars?" The programs core pillars are Mindset, nutrition, strength training, burst training, and environment. Mindset: You will learn in chapters 2,3 and 4 why making the time for your self and your health is important and it will teach you how to make time for your self and how to set realistic goals and motivating goals. Nutrition: In chapters 5 and 6 you will learn that exercise alone will not help you lose weight and keep it off. You will also learn how to stick with a healthy eating program. This is very important because I my self can eat healthy for a week or two but after that I fall back into my poor eating habits. You will even find some tips in this section on how to eat out and still eat healthy. Strength Training: In Chapter 7 you will learn how to use strength training to burn fat and keep it off. It also teaches you how to strength train safely and with out bulking up. Burst Training: Chapters 8 and 9 teach you how to use burst training instead of traditional steady-state cardio. You will also learn in chapter 9 how to include burst training into your exercise routine. Environment: Finally in Chapters 10 and 11 you will learn how to shape your environment around you in order to maintain the changes you have made in your life. What do I think about this book? I love the book. This is the perfect book for new moms, old moms, pregnant to be moms, and any busy woman. I love the inspiration I found in the chapters. At the end of each chapter you will find stories from moms who have used this program. Some where in this book you will find a story that you can relate to and feel motivated from. While I was reading Fit Moms for Life I started to wonder if I would be able to do the burst training after all I am not a young mother but a not so healthy grandmother. My worries were quickly brushed away by Donna's inspiring story at the end of chapter 7. I do plan to try the Fit Moms for life plan after talking to my doctor and if all goes well I will keep my blogging friends informed of the results. 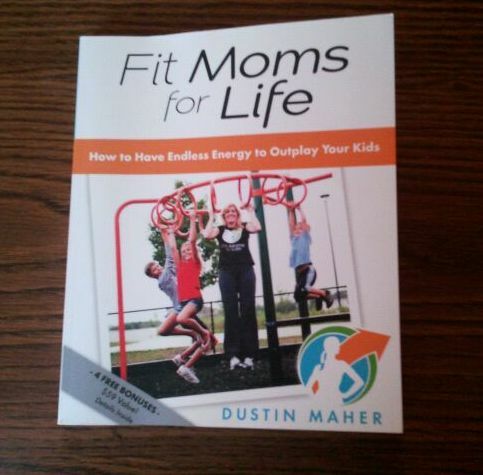 To purchase a copy of "Fit Moms for Life" go here. To win a copy enter the raffle copter below. has not received monetary compensation for this post. A copy of the book Fit Moms for Life was given to me free of cost in order to review this product. Posted by Grandma Bonnie at 2:12 PM Labels: book review, Christmas Giveaway, Fit Moms for Life, new years resolution. Thank you so much for the chance to win this great giveaway. My new years resolution is not to make a new years resolution lol (I never keep them). I am however, setting some goals starting with getting more organized. a little bit better at everything. This is a great giveaway. My resolution this year is to find me again. Getting fit and healthier again would be a step in that direction. I need to lose some weight and get healthier. Getting fit is one of my New Year's Resolutions! Also, being more organized, buying a home, starting a cat rescue shelter (with the new home & property), starting a pet waste removal business with DH...that's all I can think of for now! Whew...so much to do! My New Year Resolution is to start exercising, eating healthy and get off meds. to lose weight and get organized. I loved all the doodads, i have never entered a raffle before. Too much fun.